Is Maskless CPAP Right for Me? Is the CPAP Pro at Nomask.com Effective? LoveToKnow Sleep can help you find the information you need to determine if you or a loved one should be tested for sleep apnea. Whether you are looking for information on sleep apnea symptoms or treatment options, you'll find informative articles from sleep disorder researchers and experts. There are many options for treating sleep apnea including various types of continuous positive airway pressure (CPAP) machines and masks, oral devices and surgery. Informative articles on all of these options can help you decide which actions you need to take to live well with sleep apnea. 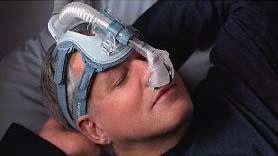 LoveToKnow Sleep provides tips on which CPAP machines and masks to consider, ways to adapt your environment to improve your sleep and ideas on how you can improve your sleep apnea treatment process such as special bed pillows to add to your comfort and CPAP accessories to help you improve your sleep experience.